CIAO LOVELIES!!!!!!!! If you haven't yet heard the news, in July, Rakuana and I are going to see Panic! At The Disco live!!!!!!!!!!!!!!!!!! If you can't tell, I am SO EXCITED!!!!! HUGE THANKS to Rakuana for this!!!!!!!!!!!!!!! This is my childhood dream come true!!!!!!!!!!!! So, in the spirit of this amazing thing happening, I thought I'd do a little post on how to prep for a concert, whether it's your first, second, or billionth concert you've been to! 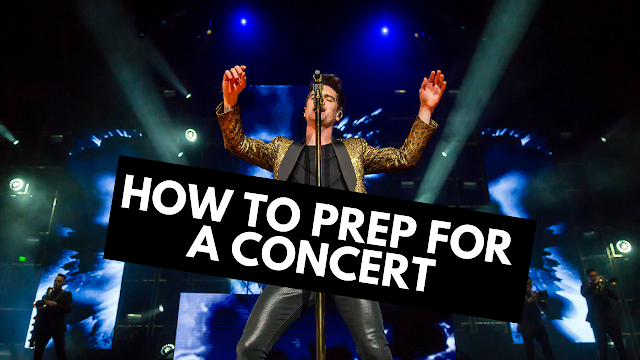 So, what types of things should you do to prep for a concert? #1- Listen to the music from the bands, including some from the opening acts! If you've ever been to a concert before, you know that normally there are at least 2 opening acts before the main headliner act. So I figured a good way to prep for the concert is to find out who the opening acts are, and get acquainted with some of their music. And of course, to listen to the headliner's music! -Your favorite outfit! This could be an outfit that you feel comfortable or just confident in! #3- DIY time! Time to make some stuff to wear, signs to hold up, and accessories to wear! So maybe you're like me and you have plenty of time to craft some DIY accessories to wear, or even diy-ing a new outfit to wear! So you'll want some tutorials, I'd imagine! Lucky for you we have plenty! Check out our DIY tag for plenty of fun clothing, accessory, and even beauty DIY's! Talk to the people who you're going to the concert with and get super hyped up! Maybe even post on social media about it! Or blog about it, like I will be doing! Thanks for reading! I wish you lots of fun in going to your concerts! I can hardly wait until July!!!!! If you haven't heard, we have new Merch! We just released some new designs!